Ravi Sons World Wide offers hydraulic press brake we are manufactures and exports of technically advanced hydraulic press brake which comes having all the most recent features as per industry standards and requirements. 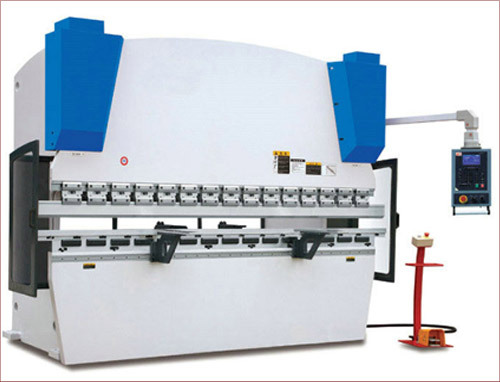 Hydraulic Press Brake has been designed to present minimum deflections and maximum rigidity. The machine sees a pair of hydraulic cylinders, coordinated by a heavy duty torque tube welded to the lever. This facility has been put in to make sure supreme parallelism between them and the table working surface. Sheet bending press, sheet metal press and sheet folding press have been endowed with the different types of hydraulic press brakes we present to a vast array of customers across the globe. Press Brakes from us comprise three operational modes for operator and least fatigue convenience. Such brakes are recognized for their huge versatility, rapid setting, low cost, easy maintenance and accuracy. » Rugged structure from ultra tested IS 2062 grade B plates rigidity conforming to international standards. » Hydraulics, electrics of internationally reputed brands for consistent performance and reliable operation. » Pivots with permanently lubricated bearings or hardened part lubricated by central hand pump. » Cylinders of ultra-tested seamless honed tubes, hard chrome-plated pistons. dual seals. » 3 Speed bending cycles for faster output yet slow smooth bending with minimal shock loads. » Movable control station with majority controls, emergency stop, up-down foot -switch controls. » Inch cycle mode for srt-up & one-off jobs. Single cycle modes for repeat cycles, production runs. » Hydraulic power gives silent working, better safety against overload, instant stopage-reversal ram. » One set of unhardened standard punch, multi-vee die block. » Lifting hooks for lifting and rotation of die block when using multi-vee die block.